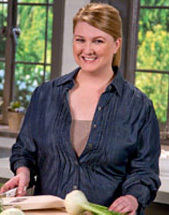 Anna Last joined Martha Stewart Living Omnimedia in January 2009 as Editor of Everyday Food, a digest-sized magazine featuring simple and delicious recipes that provide the taste and quality consumers expect from the kitchens of Martha Stewart. She is responsible for overseeing the magazine's editorial and visual content, and also helps shape Everyday Food's presence across MSLO's platforms, including Publishing, Internet and Broadcasting. Prior to joining Martha Stewart Living Omnimedia, Anna was acting Style Director at Real Simple. A highly regarded editor in the lifestyle, interior and travel magazine world, she has held the position of Food Editor at both Vogue Entertaining + Travel and Marie Claire magazines in Sydney, Australia, and contributed to Vogue Living, InsideOut and Qantas Inflight magazines. She has also consulted on cookbooks with high-profile chefs including Andrew Carmellini, Christine Manfield and Karen Martini. A native Australian, Anna grew up on a farm where her lifelong love of all things food and cooking began standing on a chair "helping" her mother, a great cook. Anna currently resides in New York City.